White Togruta montral with blue bands and stripes matching references. Six (6) small triangular and one (1) large diamond Akul teeth on the head framing the face, the color should be silver, gold, or silver green. Diamond beads for padawan chain shall be a mix of silver, gold, or silver green. Must match reference pictures. Orange with accurate white markings in the face. Must match reference pictures. Tight-fitting bodysuit with a hidden/invisible zipper in the back, turtleneck and without hands. Colors are maroon, Burgundy or dark red, elastic/stretch material like velvet (not crushed velvet), micro-suede or similar. Gloves are the same color and material as the bracers. The material should be leather or leather-like and have texture. Bracers reach to the crook of the arm on the inside and do not cover the elbow. Leather or leather-like material, lighter than the color of Bodysuit and have texture. The bracers have 3 golden buckles with a stylized “H” must match references. The separate elbow covering is in the same color or darker than the bodysuit. A single elongated pentagon, leather or leather-like material. Color is pale pink, with markings in a darker purple/magenta on it. Must match reference pictures. Phase I animated style Clone Trooper Belt. Armor is painted matte or satin white. The belt is approx 3" tall and divided into 1.75" wide segments. The front segments have a key/slot detail. Belt boxes are mounted at the hips. The belt is weather shades of grey. Detonator is centered on the back of the belt. Detonator has no control buttons. The detonator has (2) lines set in approx 1/2" – 5/8" from the edges. Lines may be recessed or painted on. Boots and Chaps are the same color and material as the bracers. The chaps reach the kneecap and are closed with 5 golden buckles on the outside of the leg. The buckles have the same design as the bracers. Light gray weathering as the bracers and gloves. Both the boots and boot spats/chaps should be leather or leather-like material and have texture. One lightsaber. If bladed, the blade is green. Toy sabers are not permitted. -What do you think about the tabbard to notice that the first central diamond is covered by the belt? -Also, the international length measurement system is the meter, I would say to add the measurements of the clone belt also in centimeters, perhaps in brackets. And I think we have to add the Thickness of the belt of 1cm as we can see in the second reference image. Remove the measure of the width of each segments because it depends a lot by the measure of the waist. The lines on the detonator isn't painted but carved as we can see in the reference. 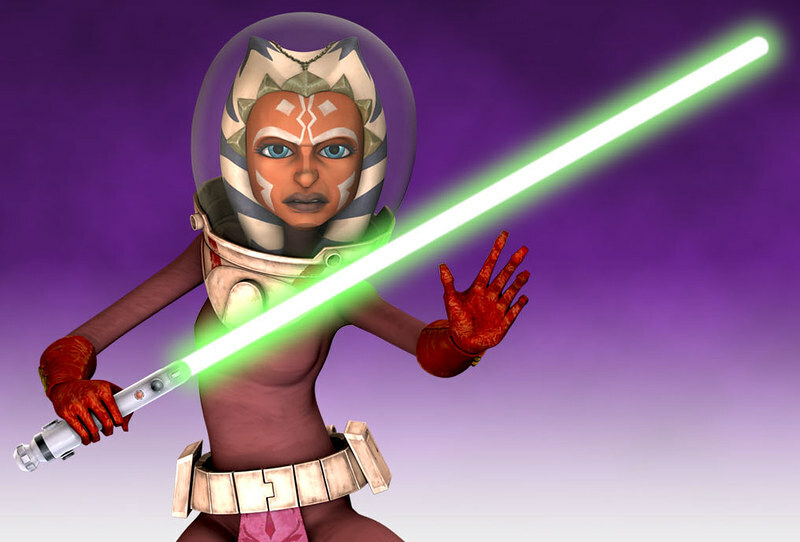 For the headpiece: Until a point when all the other standards can be edited that a non uniform color is optional (as almost all approved and currently being submitted Ahsoka's are solid) making it noted in 1 standard may provide an issue as wording will not be consistant. Measurements: I got these directly from the Clone trooper CRL from 501st legion, it's the wording they use, internationally, consistent wording is again, key to combat confusion. Akul teeth and coloring: I've done my own color grabs on this before and more often than not it came on a green scale for Pantone, noting that the beads must match the color of the teeth is yes, important, and will be changed later, but it has to be changed on all applicable standards. The circumference of the upper belt is smaller than the under belt line, and also the vertical line aren't perfectly vertical... For a complete armor I can understand but here I think the belt can Dress badly, especially for those with more curves.